With traditional methods of dyeing polyester fabric, most manufacturers waste 3 gallons of water for every yard of fabric. The current system for dyeing synthetic textiles is based on outdated methods for natural fibres. It’s like putting diesel in an electric car; Polyester textile technology has come leaps and bounds, and yet we still do piece dye? Why? 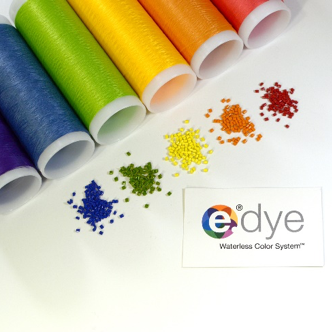 By mastering the solution dyed polyester process, e.dye Waterless Color System presents a paradigm shift in textile dyeing that results in a 75 percent water savings in comparison to traditional piece dyeing, a superior colour fastness, and a precise colour system for matching and consistency. The E.dye Waterless Colour System can demonstrate very clear water, energy and chemical savings. It requires less energy, reduces C02 emissions and limits the chemicals used in traditional production processes. First, they mix the Master Batch in specific amounts with virgin or recycled PET chips, this mixture is controlled by their Innovation Centre staff. Several computer-controlled machines mix and melt the PET chips and Masterbatch together. This ‘solution’ is melted in an extruder, after being mixed to a uniform dispersion. Once heated into a liquid state it is extruded into filament. These filaments can be various diameters, depending on the size of the spinneret, they get spun together into yarn. After that, texture can be added and the yarn can be woven or knit into textiles. The result is a a re-cycled fabric with a dramatically lowered consumption of water and energy.